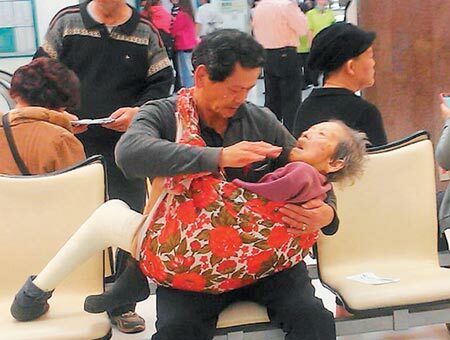 Filial piety has become a hot issue in Taiwan after video of a middle-aged man carrying his frail mother into the Chi Mei Hospital went viral, touching hearts all over the country. Now people want to know more about the man in the video. On Sunday, the local Apple Daily confirmed the man's identity as Ting Tsu-chi, who retired from the Bureau of Investigation in the southern city of Tainan five years ago. He applied for early retirement in order to take care of his elderly mother. Three days ago, the video of Ting carrying his seriously ill mother to see doctors was re posted on the net repeatedly. Many netizens have dubbed him "the model of filial piety," and other users said he is the "25th filial exemplar," with his story titled, "He wrapped his mother in cotton cloth." The 24 Filial Exemplars is a classic text written on filial piety by Guo Jujing during the Yuan dynasty (1271-1368). Ting Tsu-chi, 62, has stayed mum on the incident, and when reporters asked his former colleagues to ask him for an interview, he told his friends to tell the reporters, "These are my personal affairs, I would rather not." His neighbors said they have hardly any interaction with Ting so they don't have any impression of him, yet when looking at the photo of him carrying his mother to the hospital, one neighbors said, "It's incredible to see such a scene in today's world." Ting talked to his former boss Mo Tien-hu, currently the chief of the Tainan Bureau of Investigation, about the incident in a phone call, saying his mother has had a stroke and can't move well, and last month she broke her leg. Ting reportedly said that because his mother is fragile and thin, sitting in a wheelchair would be not suitable for her, as her broken leg could be hurt if it bumped into anything. He decided using a wrapping cloth to carry his mother would be the best option to take her into the hospital. According to Mo, Ting's father died in 2006 and his mother was depressed after losing her husband. She asked Ting to take her back to mainland China to see relatives, and he complied. At the time, he was up for promotion at the Bureau of Investigation, but he passed it up to take care of his parents. ''When I was small, you carry me; When you grow old, I carry you'' ........one newspaper commended as saying. These words touched many a heart. Hope all of us would apply what we have read and seen. Keep on reading young man. Professional Ethics between The Asian & The West. How sharp is your mind? What is the most blessed prayer? Are you a good dad???? What retirement he is talking??? How could you tell your bride is a virgin?? ?